Over 95 percent of basement concrete cracks are not a structural threat to the foundation, basement walls, or floor. Most wall cracks only pose a water seepage problem. Leaks are not only inconvenient, but the continued moisture can decrease the indoor air quality due to hidden mold, mildew, and fungus concerns. Ignoring leaking water can result in time-consuming clean-up efforts and continual expenses. The majority of basement concrete cracks are formed within the first 30 days after pouring the concrete structure. Until the cracks begin widening, detection may be delayed. These types of cracks often occur because insufficient amounts of working joints were placed during construction to account for drying shrinkage and thermal movement. Other common cracks involve structural settlement, overload, or earthquake damage. Epoxy and polyurethane-based injection materials are effectively used for concrete crack injection repair and waterproofing of basement leaks. Supporting materials such as dispensing equipment, surface ports, corner ports, grout injection packers, and assorted essential tools aid efficient injection for fast-reacting dual component polymers. 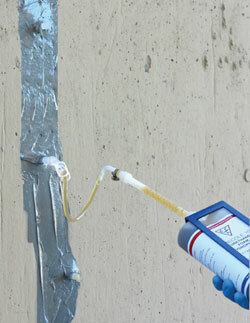 Epoxy Crack injection Low-pressure concrete crack injection (20 to 40 psi) permanently fills the entire length and depth of the crack, preventing water from further deteriorating concrete. Epoxy and polyurethane-based materials are superior for this purpose because they adhere to the concrete, water cannot erode the concrete any further, and the materials allow for slight concrete expansion and contraction while maintaining a seal. Concrete crack injection has been the accepted method for these types of repairs for many years in the Midwest. It is cost-effective, reliable, and permanent. Materials with differing viscosities are manufactured to ensure that we can offer homeowners an effective repair for only hundreds of dollars as opposed to thousands of dollars on more extensive structural solutions. Avoid Superficial Repairs. Many homeowners may be tempted to use caulk or hydraulic cement to patch concrete cracks. Caulk is superficial and will allow water to continue seeping behind the patch material, resulting in efflorescence, and eventually the caulk will peel off exposing an enlarged crack. Hydraulic cement does not bond well, also leading to efflorescence. Eventually, the water seepage will dislodge the cement plug. We have nearly a 100 percent success rate for crack repair work. Also, we can perform multiple concrete repairs in the same day. Fill out our short form and we will contact you to go over all of your options. You can also call us at 630-761-1634.